As Puerto Rico and its advisers struggle to develop a package of reforms to combat years of fiscal mismanagement, U.S. officials are discussing the issuance of a “Superbond,” possibly administered by the U.S. Treasury, that would help the commonwealth restructure its $72 billion of debt. Under the plan, the U.S. Treasury or an identified third party would administer a “lockbox” that would hold some of the Island’s tax revenue. The funds in the account would be used to pay interest on the Superbond. Puerto Rico has been unable to issue new debt after years of selling bonds to bridge funding gaps. 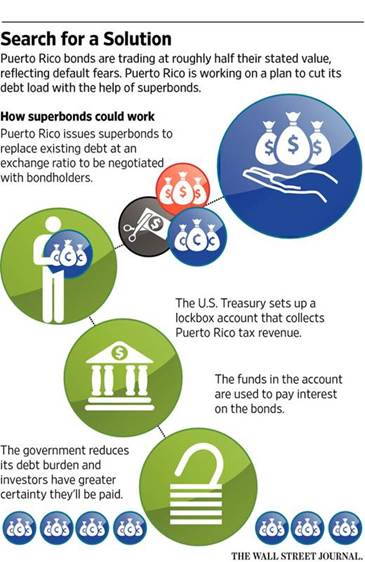 Thus far, bondholders have been unwilling to accept a haircut and swap their bonds for new debt that is only backed by Puerto Rico tax revenue, as they fear that money for those bonds could be diverted elsewhere. Under the current proposal, the Treasury would help safeguard Puerto Rico’s tax proceeds to ensure they would not be used for any purposes other than to pay off debt. In theory, this security should provide some comfort to creditors and allow the commonwealth to borrow at lower interest rates. The likelihood of the program getting off the ground is low, however, as a Superbond would need to clear high political and logistical hurdles. Those involved have said that any plan would not include U.S. financial aid or a guarantee of Puerto Rican debt.